The other day, I noticed an article on the Washington Post website about Gallup creating an emotional map of the world based on their polling data. You can check out the article yourself, but I always have a hard time with maps like this. I start thinking of people I know from different countries to see if they fit the map. 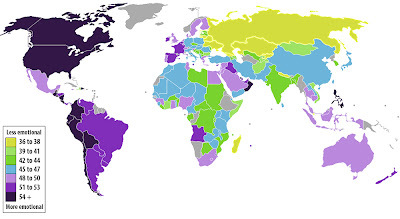 Of course, this is nonsense as there are more and less emotional people in every country, but in general I still enjoy thinking about these things (and an excuse to look at a map in a new way is always fun). According to Gallup, Singapore is the least emotional country whereas nearby Philippines is the most emotional. There are other trends that can be witnessed here. Russia and the old Soviet Bloc nations tend to be less emotional. The Americas tend to be more emotional. One thing I wish was that the map for the United States was broken down by state. As I've traveled around our country, I've noticed that the upper Midwest in particular tends to be rather stoic. Emotions are clearly tied to our culture and affluence. Clearly, as can only be seen by stepping out of our culture, and becoming "Tolleish". You are not alone. This has been my very experience the last few weeks. I am only just starting to see that when I respond extremley – feeling very suicidal when there is a small change in my life – that something is probably being triggered. I still struggle with tolerating emotions and when I can’t use intellect to work my way out of things I justt panic and despair. Thank you for reminding me I am not alone. To get more info just check out plagiarism detector. “Nate's Nonsense” is my favorite list for a long time. I have pleased to read the entirety of the post as mentioned above in detail. If you need writing service just visit https://hitthegrade.com/ now. Thanks and have a good day! Pretty! This has been a really wonderful post. Thank you for supplying these details.Awesome article with a lot of great takeaways for improving my content writing skills.